I removed the passenger side coil bracket, coils and plug wires on the LS1 to verify clearance between the valve cover/cylinder head on the passenger and the A/C-heater cover shroud. 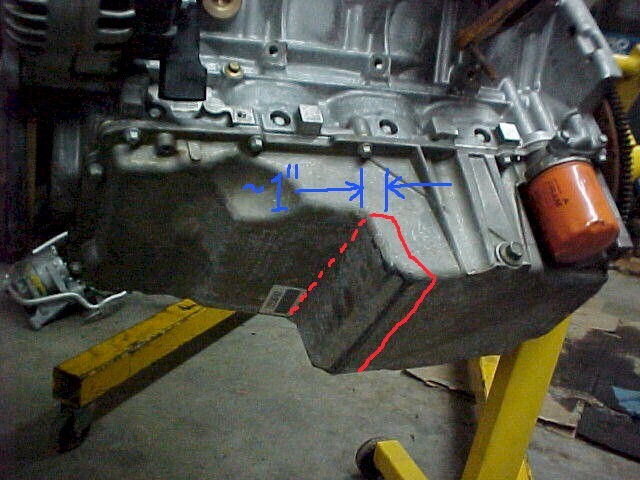 I used a 7/16" wood spacer between the rear engine saddle and F-body oil pan (picture shown with a bolt used as a spacer instead of wood) to simulate the minimum clearance that I find acceptable here. 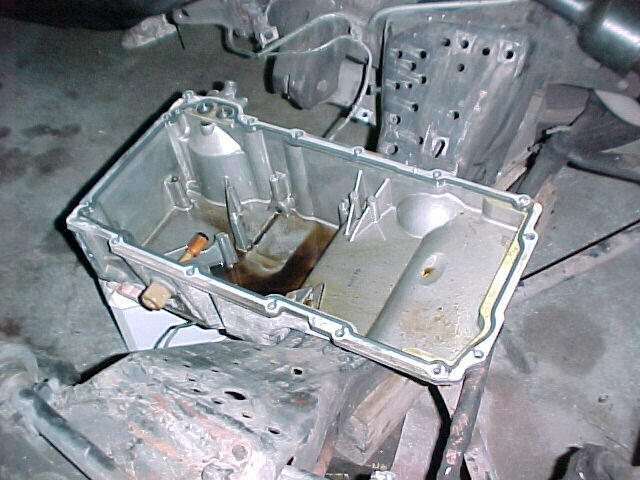 Using the F-body oil pan I still cannot get the clearance I want at the passenger side valve cove/cylinder head (even with the coil and bracket removed) at the A/C-heater cover shroud. 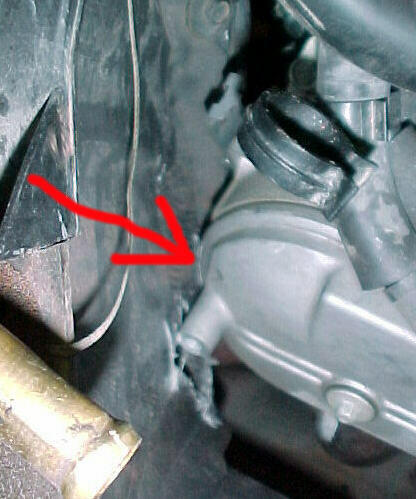 I tried using the same thickness wood spacer between the valve cover/cylinder head and A/C-heater cover shroud This caused the rear of the motor to move toward the driver's side. Upon trying to re-center the motor again the wood spacer crushed a larger hole in the already damaged A/C-heater cover shroud. I hate to say it, however, unless some type of other brainstorm hits I have resigned myself to the fact that I am going to notch and box the rear of the engine saddle about 1" toward the front of the car and 10" across to make adequate clearance for the F-body oil pan. This will also enable me to position the motor exactly where the L69 sits side to side and probably about 3/8" - 1/2" forward to clear the A/C-heater cover shroud properly. My next debate now is since I will be cutting and welding the back of the engine saddle, should I just notch the right front portion of the saddle to clear the A/C compressor. I guess a lot here will depend on what I hear back from Street and Performance. Contacted Street and Performance regarding their high mount LS1 Vette A/C bracketry and found out they want over $300 for it and it requires their special A/C compressor for another $250+! I don't like the look of their compressor with its billet style front pulley since I want my accessories to remain OEM looking. I will be fabricating test brackets myself now! I am now leaning 50/50 on the frame modification to fit the motor vs. modifying the oil pan after thinking more about it. I am trying to determine the structural consequences of modifying the existing cast aluminum pan by notching it about 1". 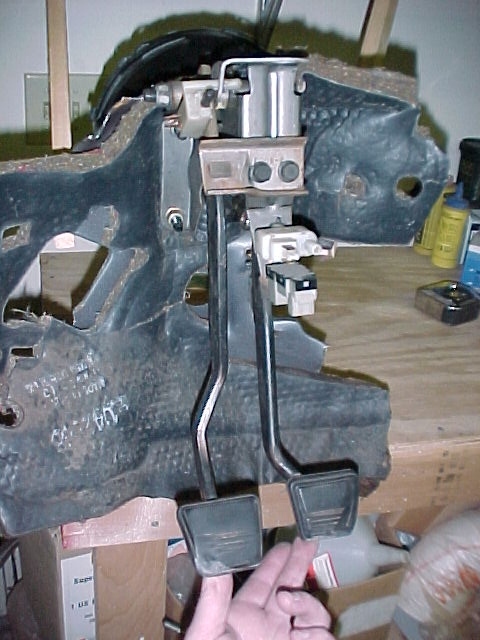 Removed passenger side inner front fender to gain access to the L69 engine wiring harness/computer to disconnect the holding strap/grommet at the firewall and remove the computer located in the interior passenger side right kick panel. Removed the TH200R4 console mounted floor shifter and console. 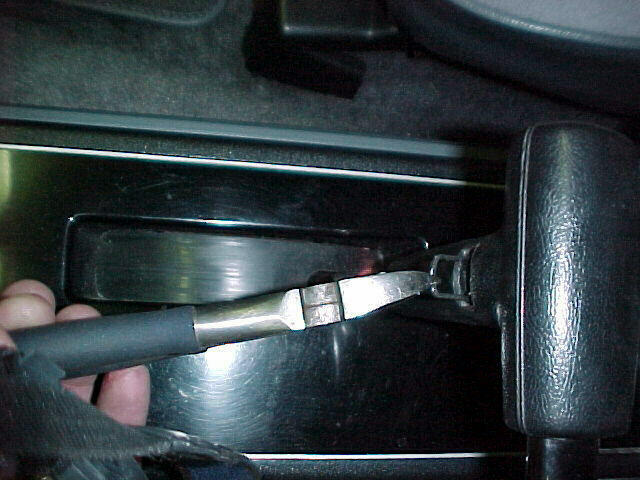 This picture shows how to remove the retainer clip holding the shifter handle. 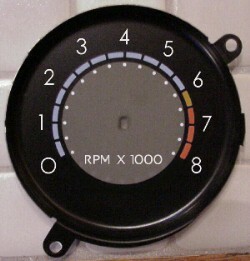 I am working with a local gauge restoration specialist to modify my existing factory 6000 RPM tach to read 8000 RPM with a 6500 RPM redline (mock-up picture here). I also need to have a new circuit board fabricated to properly read the square-wave signal generated by the LS1 PCM. Tacoma Speedometer & Instrument has located a supplier for this! I am currently mocking up a 160 MPH speedo face to match the high RPM tach. I'll post the results of this and the feasibility of making it as I make progress. I went to a local wrecking yard today to find the fuel system components that I will need, primarily a fuel injected car gas tank and fuel lines. 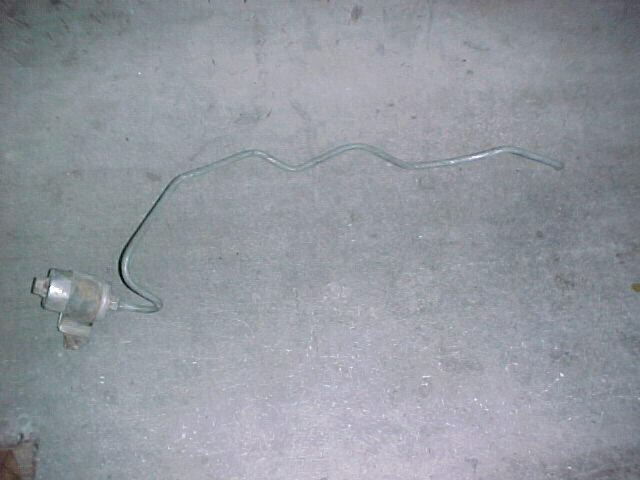 I found a 1985 Monte Carlo 4.3L TBI gas tank which is used in Fuel Injected applications with the plastic baffle inside the tank to prevent gas sloshing at low fuel levels. It is the same tank as the Buick TR/GN. Unfortunately it didn't have the sending unit with it so I will still have to get one. I also removed the steel fuel feed, return lines and tie downs mounted on the passenger side frame rail all the way from the gas tank to the engine compartment. I was especially interested in the stock fuel filter bracket since this will place my filter on the passenger side frame rail next to the front of the right lower control arm. 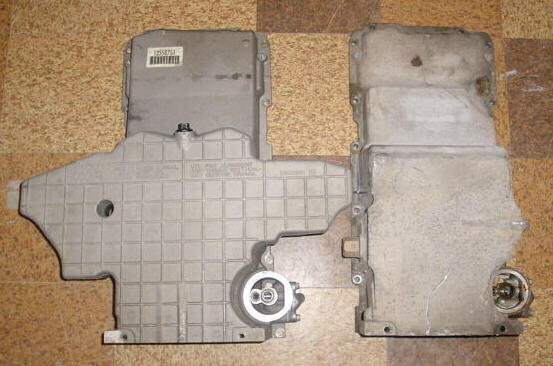 I am still waiting for the C5 oil pan. 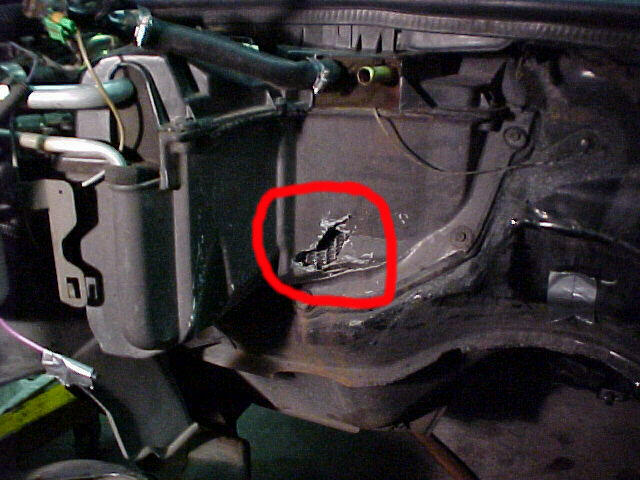 In the mean time I figure that I had better explore one of my back-up positions to this which is notching my existing F-body oil pan. I removed the pan from the LS1 motor and test fitted it again for final marking in the car. 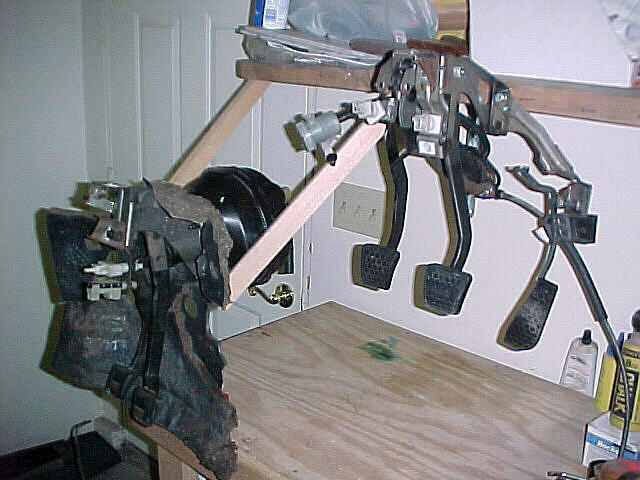 I also began the initial fit-up of the manual clutch and brake pedals. 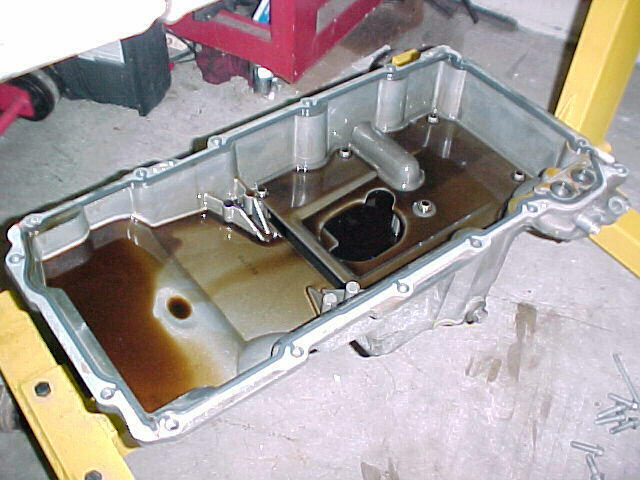 This is a view of the F-body oil pan just as it was removed from the motor. Here is the windage tray (held up by a 3/8" ratchet extension) taken at an angle to show the relationship of it to the pan itself. 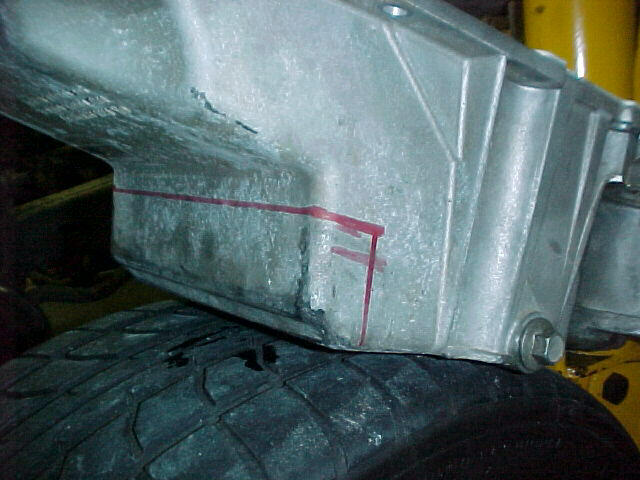 I mocked up the location of the engine with just the pan in the car to within +/- 1/8" for purposes of using a red marking pen to indicate where the notching (left side shown) is required to clear the engine saddle frame. 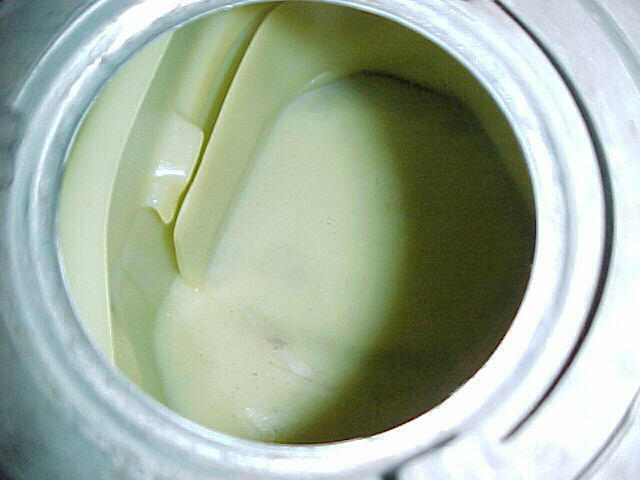 This view of the pan shows the final proposed notching in the event that the C5 pan doesn't work out. 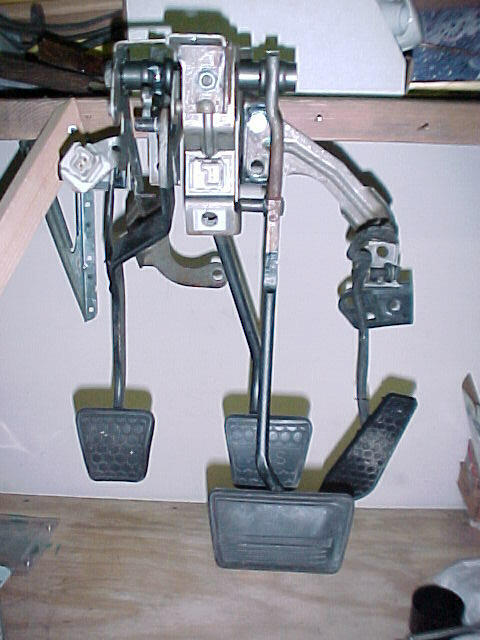 I removed my brake pedal and bracket to add the manual transmission brake and clutch pedals to the existing bracket in preparation for the T56 fit-up. I am using pedals out of a 1981 Monte Carlo 3 speed stick car. 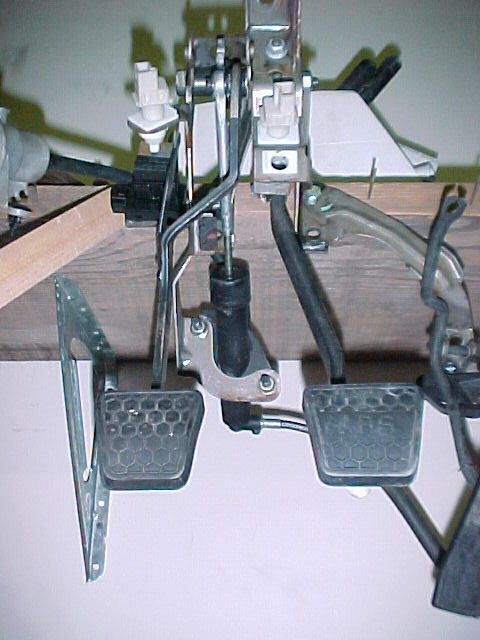 Pedals from any 1978-81 Monte Carlo/Chevelle/El Camino are the same regardless if 3 or 4 speed manual. 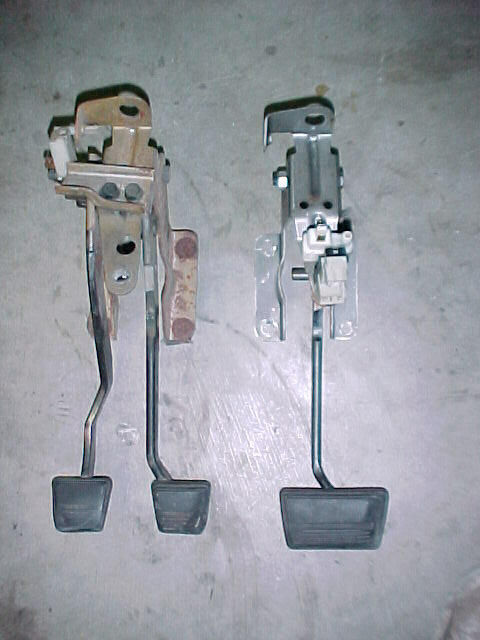 This picture compares the '99 F-body pedals (on left of pic) to the '81 G-body pedals. Quite a difference but the '99 set-up could be modified to work in a G-body if needed. 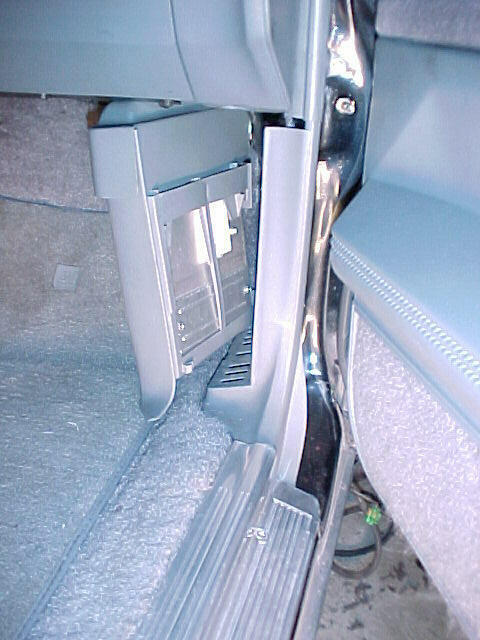 Notice the difference in length between the F-body brake pedal and the longer G-body pedal. 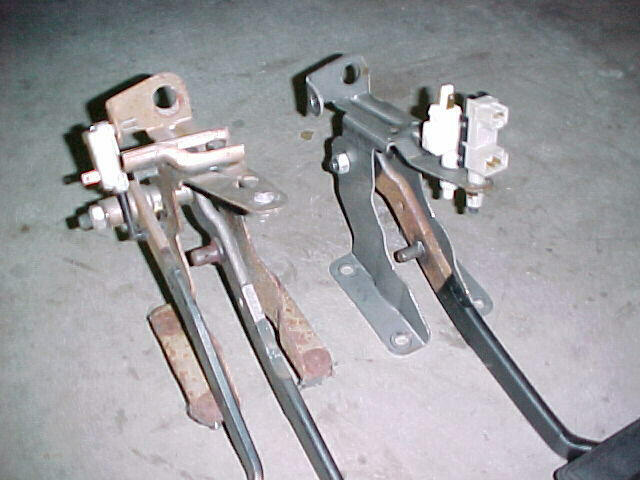 The brake/clutch pedal bracket for these cars which attaches to the brake power booster is about 3/8" different between the '78-'81 set-up versus my '88. I thought that they would be the same but was mistaken! The '81 set-up has studs attached to the bracket and my '88 has the studs integral to the brake power booster. 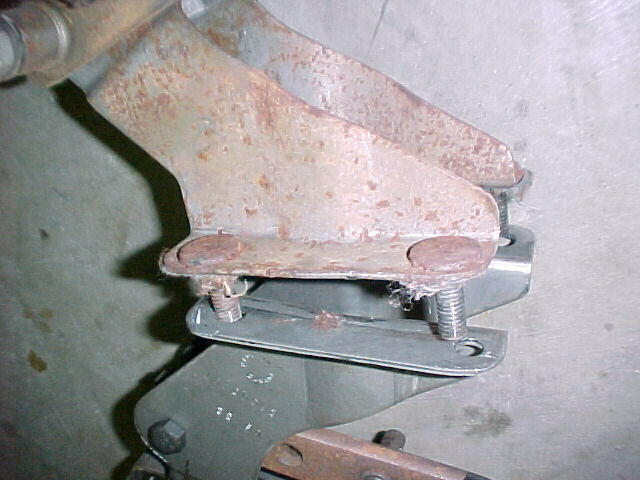 The brake booster connecting rod stud on the '81 manual brake pedal is also in a different location than the '88 automatic brake pedal. This will require relocating to match the '88 set-up. 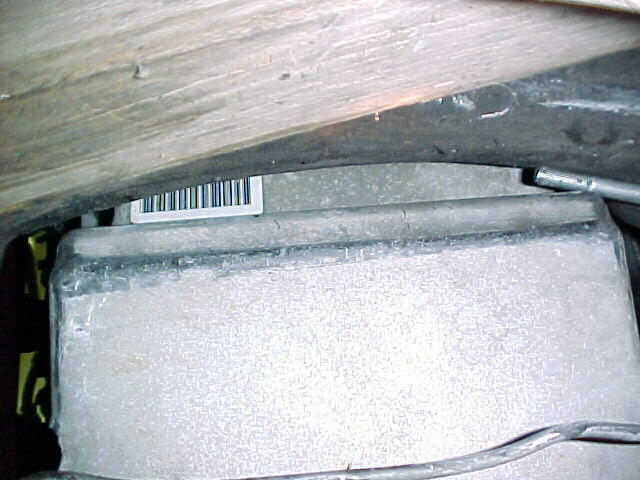 Coincidentally a correct hole location for the brake booster connecting rod stud is already provided on the '81 brake pedal. 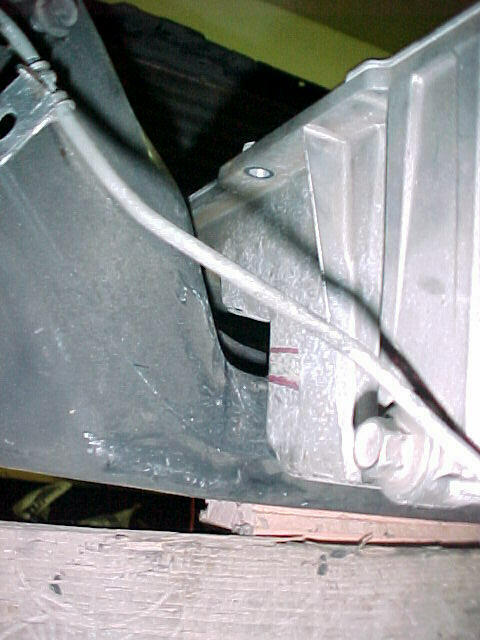 I removed the vacuum line and wiring harness which goes through the firewall just below the brake booster since the F-body hydraulic cylinder will need to go through the firewall in this location. I am not sure at this point what I am going to do with my existing cruise control set-up. 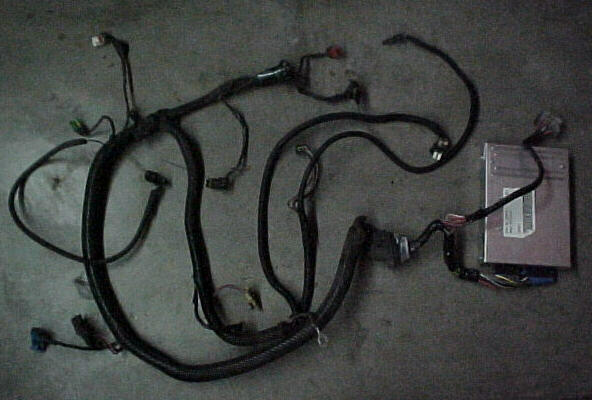 I will have to explore later if it makes more sense to use the '99 F-body cruise control set-up with this new motor in lieu of what the '88 SS comes with from the factory. 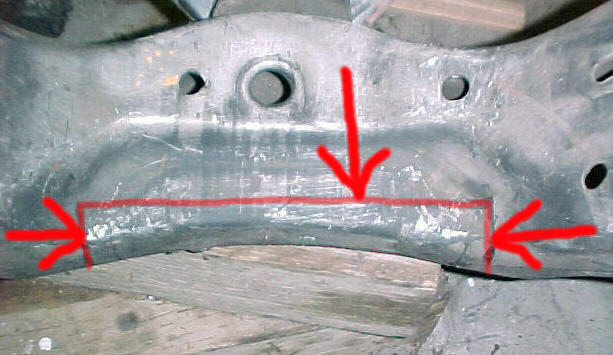 I made another trip to a local wrecking yard, this time to cut out a section of the firewall from a G-body surrounding the brake booster and the ~1-1/2" diameter hole below it. 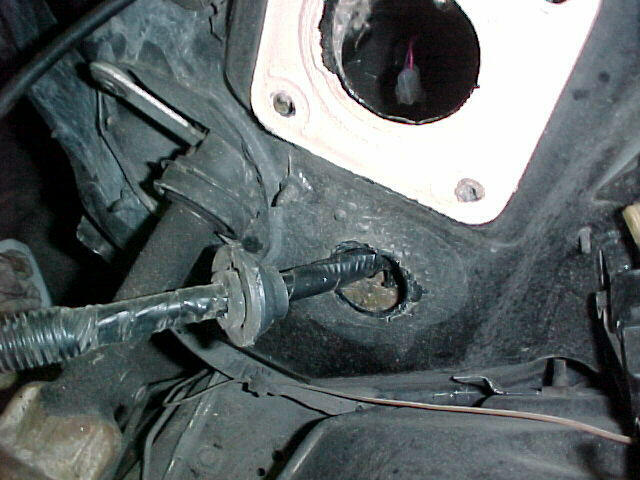 The '78-'81 factory stick shift cars used this hole for the mechanical linkage rod to pass through and connect the clutch pedal to the cross-shaft. 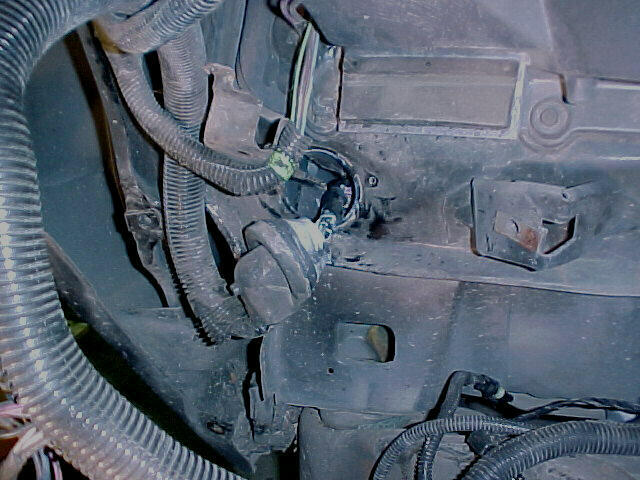 Later model vehicles used this hole for the cruise control wiring/vacuum line to pass through the firewall to the brake pedal otherwise a plastic filler covered the hole. In addition to cutting out about an 18" piece of firewall sheetmetal I also obtained the insulation padding (approx. 1/2" thickness uncompressed) that goes underneath the carpeting and sandwiched between the brake/clutch pedal bracket and firewall in order to simulate all of the necessary components. 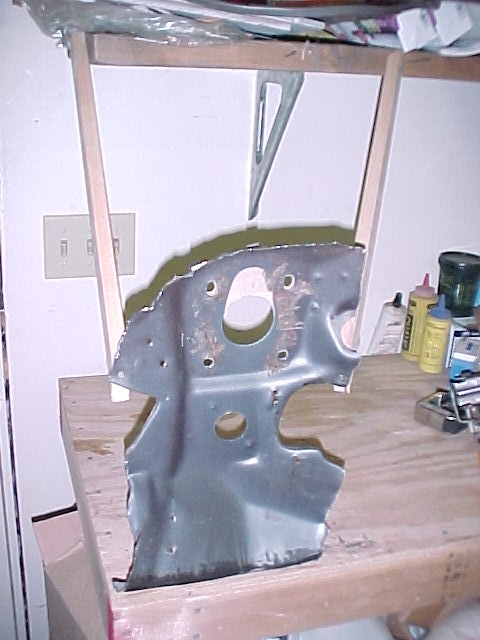 Once home, I then attached this sheetmetal onto my workbench top and added two wooded braces on each side to form a secure mock-up test fixture. I then proceeded to add the insulation padding, brake/clutch pedal bracket assembly and brake booster to simulate the completed as installed assembly. 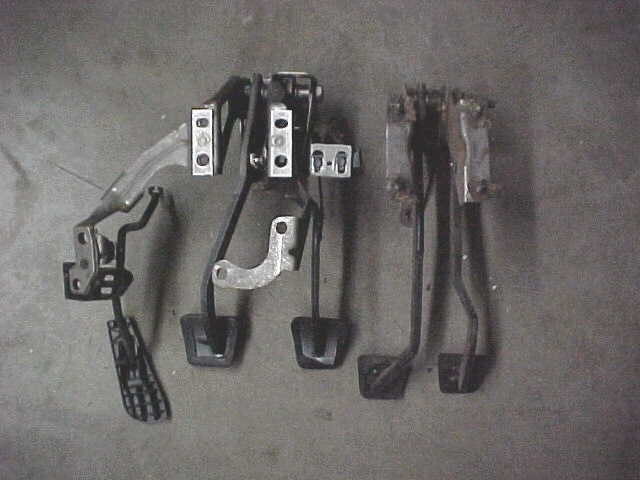 As a reference, I added a set of 4th Gen F-body pedals (out of the '99 Z-28 which my motor came out of) along side of the G-body mock-up to serve as a visual reference and to enable cross-checking and comparison of actuating rod angles and clutch pedal travel. 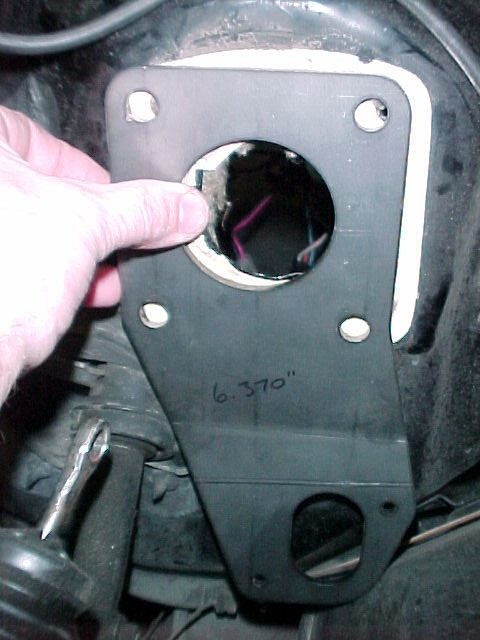 My goal here is to once again minimize cutting on my car by trying to fabricate a metal plate (similar to this one supplied to me by Scot McKittrick) which will be sandwiched between the firewall and brake booster (using the brake booster studs to attach through) to hold the hydraulic actuating rod cylinder. I want to try and use the existing ~1-1/2" diameter hole below the booster to center the hydraulic actuating rod thus enabling me to use an OEM type rubber grommet through the firewall for proper sealing. 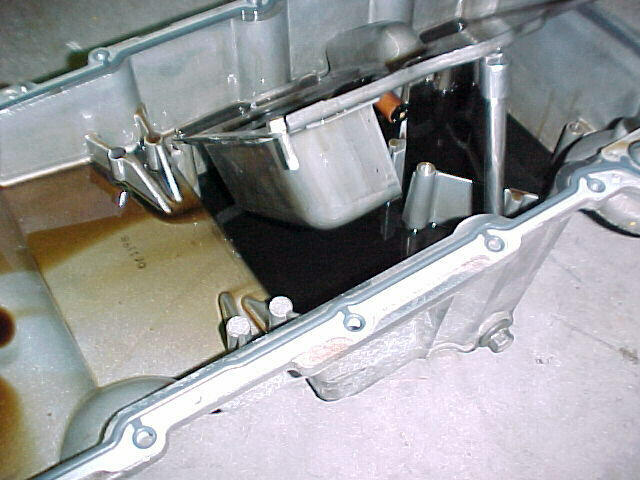 My C5 Corvette oil pan showed up via UPS today and unfortunately it doesn't come any closer to fitting the G-body chassis than the F-body oil pan, actually worse since it would force the engine rearward even more and create firewall interference. This picture compares the configuration of the two pans. Here you can see that the C5 pan is a little shallower, however, the lower portion of this pan interferes with the engine frame saddle even more. It's off to the fabrication shop tomorrow to determine what can be done to modify the F-body pan to clear the engine saddle frame. Stay tuned!